According to exit polls, United Russia is far ahead of its competitors with 46 percent of the vote. And yet, the day was far from a victory for the ruling party, which won the 2007 elections with the support of 65 percent of all voters. The long hours from Sunday night inton Monday morning could turn out to be difficult -- not only for the Russian election committee (which is currently busy counting the votes) but also for the ruling United Russia party, led by Prime Minister Vladimir Putin and President Dmitry Medvedev. Polling stations closed only at 9:00 p.m. Moscow time, so the official results of the election are still being determined. But exit polls indicate that support for ruling party United Russia has declined dramatically from the previous State Duma elections in 2007. In 2007, only four political parties managed to win enough votes to take seats in the Duma -- United Russia, the Communist Party (KPRF), the Liberal Democratic Party of Russia (LDPR) and Just Russia. Preliminary results indicate that these parties will once again be represented. 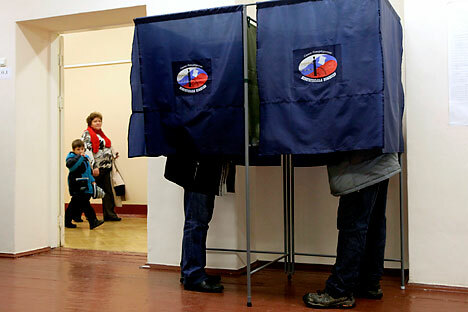 United Russia took 45.9 percent of the vote; KPRF, 20.7 percent; LDPR, 14.4 percent; and Just Russia, 13.3 percent. The remaining three parties participating in the election have not won the seven percent of the vote required to enter the Duma. Yabloko took 2.6 percent; Patriots of Russia 1 percent; and Right Cause, 0.5 percent. Until the final results are clear, political commentators and experts are unable to predict how the 450 seats in the Duma will be distributed, but according to statistical data, the Russian parliament may become much more competitive. United Russia could reduce its number of seats from 315 to 200, losing its constitutional majority. Yet United Russia retains the title of the most popular and powerful political force in the country. The results of the vote "really reflect the situation in the country," Prime Minister Vladimir Putin said as early election results were published. The three parties now in opposition, KPRF, LDPR and Just Russia, are now ready to form coalitions either with each other or with the ruling party. President Dmitry Medvedev admits that it this also a possibility for United Russia. “This day has proved that we can have democratic elections. And the preliminary results show that no party can make any decision in the parliament by itself and they will have to form coalitions. And this is good, this is healthy politics,” Medvedev said.